The basic crux of the matter is the underfunding of public schools in poor neighborhoods due to the fact that local property taxes are the main way schools are funded. The proponents of the privatization of public schools want to bust the unions, turn teachers into low wage workers and students into uniform commodities who are ranked and rated by uniform tests which have nothing to do with a true education. The “owners” of privatized schools can then extract maximum profits probably by increasing classroom sizes and replacing teachers by online instructors. Public education means that schools are controlled by people in the community where the school is located. This gives parents and teachers a role in voicing how their childrens’ education should be approached. The privatization movement would eliminate all that. Parents and teachers would not have a say in their childrens’ educations. That would be taken over by a profit making enterprise. Good school administrators who care about the children, the parents and the community can make sure that the teachers under their authority are doing a good job and if necessary replace them. This was the role my father played as a school superintendent. There was no problem in getting rid of a teacher that was not doing his or her job. His role was to hire new teachers that he felt would do a good job, and the fact that they named a school after him after he was gone is testament to the fact of what a good public school superintendent he was. Privatization would replace good school principals and superintendents with functionaries whose only interest was in maximizing profits and making the whole school experience a technical experience of getting good grades rather than in meeting the needs of students whatever those needs were. Public education is democratic education in which all parties’ interests are taken into account. Private education only takes into account the profit making interests of the owners of the school system. Most of the school reformers who insist that they want to protect children, want to develop new ways to educate them and suggest that private schools can do a better job than public simply cannot be trusted. They don’t believe any of that. Most of them are in the grip of a movement that became known in Silicon Valley as “disruptive innovation.” This is a simple belief that the introduction of new processes into industry forces people in these industries to adapt and change and develop solutions for problems that they never would have thought of if they hadn’t been disrupted. They’re not much into traditional culture — like, say, history and philosophy — and try to make economics and engineering replace those. After all, what good is something if it can’t be measured, they might ask. Finally, the people so into “reforming education,” are like chickenhawks and war; they’ve never done the thing they want to tell others how to do. 1) There are many “real problems” with respect to education, but many of the problems you mention (e.g., poverty, inequality, institutional racism, lack of funds etc…) are not problems unique to the educational system; they are broader societal problems. Do they all need to be addressed? Yes, I think they do. But, there is no reason that one cannot believe in addressing these problems and the problem Vergara brings to light (i.e., bad teachers) simultaneously. They are not at odds with one another. While many California schools are successful, this does not mean that all teachers are good at their jobs. If you think this then you either don’t have kids or you’re not paying close enough attention. “Underfunded”? Currently, California spends over 50% of our budget on education; what proportion of our budget should we be spending on education? What about the roads & sidewalks, streetlights, public transportation, our parks & oceans, health care, law enforcement, fire protection…the fiscal pie is only so big. 2) Schools should NOT be thought of as places of employment; they should be thought of as places of learning. The focus needs to be on the children first and foremost. 3) Teaching will always be an admirable and rewarding career, and given the intrinsic benefits and the monetary rewards – the average California teacher’s salary was $69.5k in 2013 (per Sacramento Bee) – I don’t think there will be any significant or meaningful difference in the number of people who go into teaching as a result of the Vergara decision. Now if school went year round, and teachers worked 12-month years, I would certainly be more sympathetic to the pay/work issues. Your statement that “most teachers leave the field within the first 5 years” is factually incorrect. According to the national center for education statistics (institute of educational science), roughly 10% of public school teachers leave the field in years 1-3 (the percent goes going down in subsequent years). What’s also interesting from this NCES data is that of those who leave, about 26% leave for “personal life” reasons. So, if I’m doing my math correctly, only 7.5% leave the field because they are unhappy with the job. 4) Teachers are covered by the same laws (e.g., civil rights amendment, ADA, workplace safety etc…) that cover all other work, workers and workplaces; tenure is not needed for this. Also, I don’t think tenure has much to do with protecting “freedom of thought” at the K-12 level. 5) I don’t think anyone is suggesting that seniority is why layoffs happen. 6) I don’t know enough about the backers of “Vergara” to defend them. 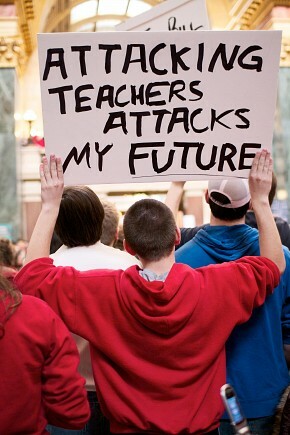 If “destroying teachers’ rights” is their goal then, I wouldn’t want to defend them. But could there be another plausible reason for the interest/support? Just asking…. Bravo, all excellent points. Although I quibble with the racism accusation. If we truly believe that we are all intellectually equal, then the race of the child has nothing to do with underperformance. The problem is poverty and bad teachers who (practically) can not be fired. We know that they exist, here in California we have recently had several cases regarding sexual misconduct. Why in the world would the teachers’ unions want to protect these scum? Because the unions’ focus is not on the children. They want their union dues which come from the teachers. Therefore, they will do all they can for the teachers only and they screw the children in the process.